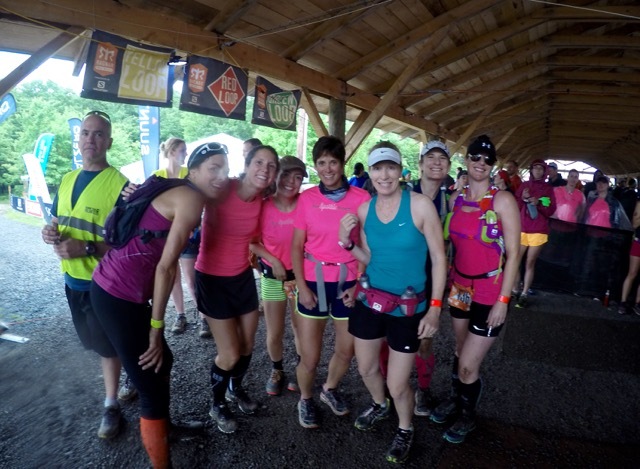 If you’re just now joining my Ragnar Trail Appalachians WV party, you can catch up by clicking on Part 1, Part 2, and Part 3 to read my three previous recaps, and you can meet my teammates by clicking here. I left off on my previous recap as I was falling asleep for what ended up being a pretty decent night’s sleep by Ragnar standards. According to my FitBit, I got four hours thirteen minutes of sleep, with eight minutes of restless sleep. I’m surprised, because it seemed like I could here people talking in the tents next to us all night long. I woke up when it got light outside and the tent suddenly brightened. I had a horrible headache from dehydration because I’d gone easy on the water after my previous run since I didn’t want to have to get up during the night to go to the bathroom. Even so, I had to go badly and even though I curled tightly up into the fetal position to relieve the pressure on my bladder, I finally admitted to myself that I had to go visit the dreaded porta potties. I had heard that they would be nasty, and they were (they started cleaning them out shortly afterward). Wearing my maroon plaid flannel pj bottoms rolled up to mid-calf so I wouldn’t get mud on them, my over-sized Virginia Tech sweatshirt, my hair in a haphazard ponytail, and my eyeglasses, I ventured over to the extremely disgusting porta potties. I looked like a mess and I didn’t care – I seemed to fit right in with everyone else at that point. I drank a lot of water and had my oats and strawberries while catching up with my teammates. 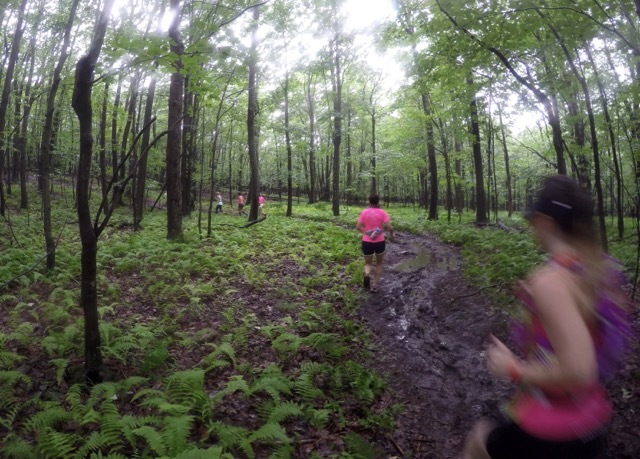 We chatted about how the overnight runs had gone, and how we were getting farther and farther behind schedule with each slower-than-projected muddy run. While chatting, we overheard another team captain mention that she was inquiring about doubling up her runners to finish earlier since they were so far behind. Gayle, our team captain, decided to check to see if we could do the same thing and was given permission to do so once leg 18 was complete. Eventually we realized that we still wouldn’t be finished until late Saturday afternoon even if we doubled up, so Melisa, our team volunteer, sought permission to triple up, and it was granted. Halleluiah! 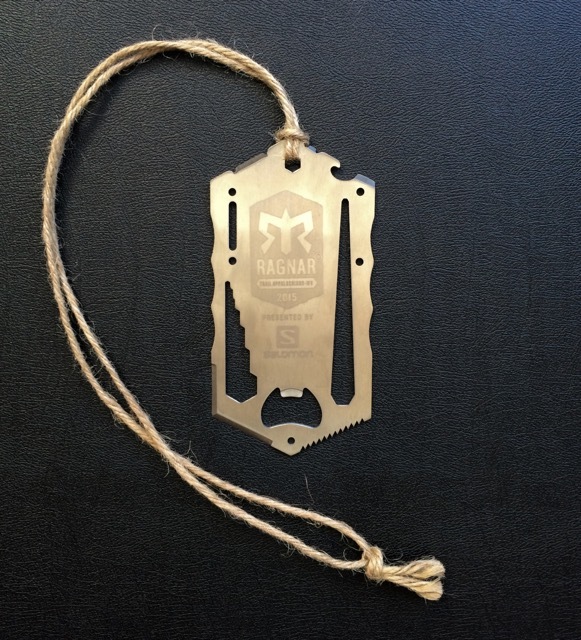 With time to spare until my next leg, I wandered around the Ragnar Village again to see what I could find. 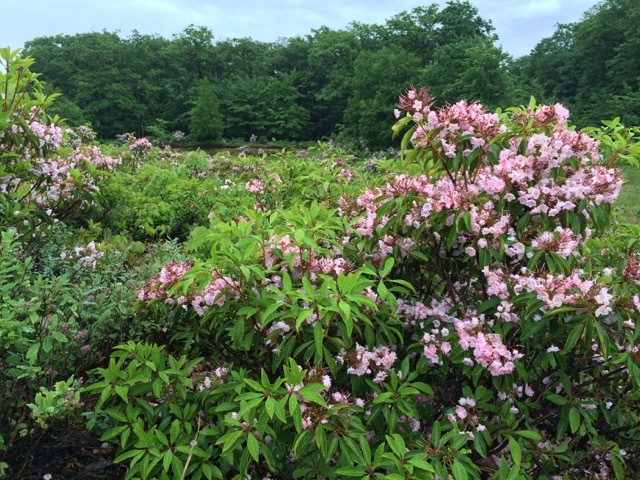 I never found Big Bear Lake, but I did find these lovely Mountain Laurel. 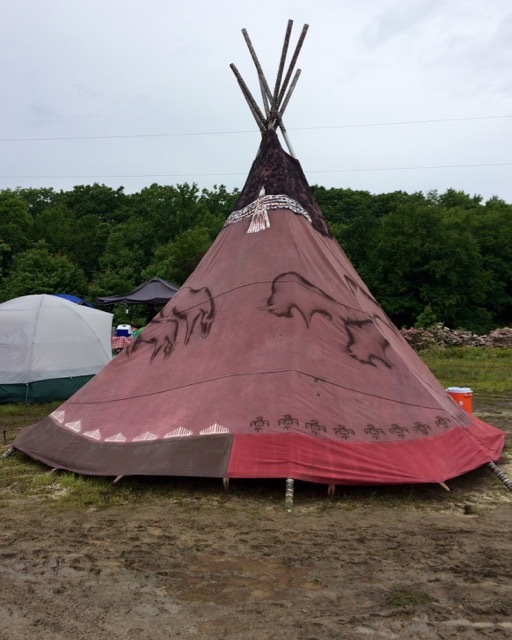 Near the activity of the showers and porta potties we walked past an Indian tipi. And near there we found this sign. 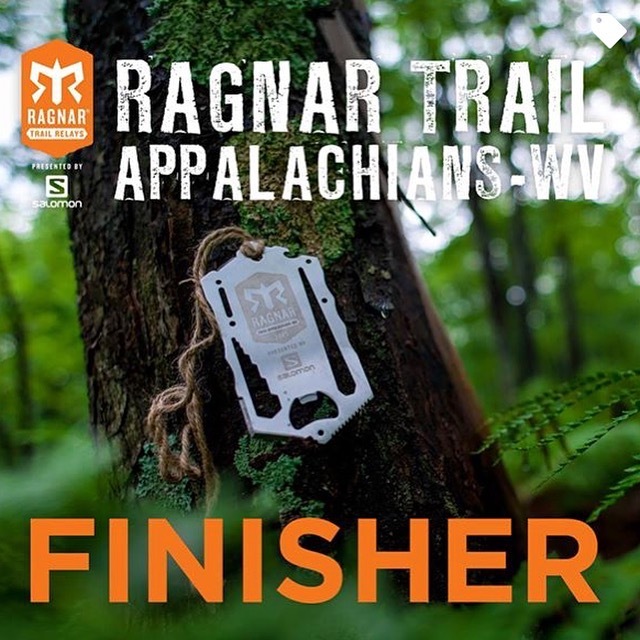 Someone from the Ragnar team said that the trail conditions at this year’s Ragnar Trail Appalachians were in the worse conditions of any Ragnar Trail event run to date. Yipe – bragging rights for all of us! On higher ground from the Ragnar Village I found these tents. I think they’re the ones we ran past as we approached the bridge on each of our runs. If we did, it was on the lower side of them. I’m totally turned around now that I’m looking at the maps and my pictures from the dry mud-free comfort of my home. 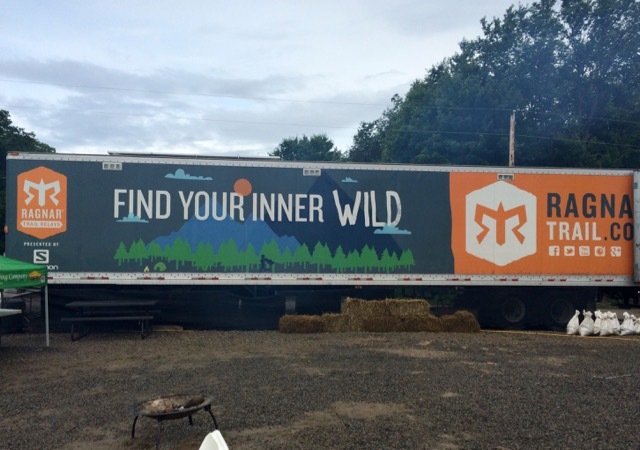 Blocking off the north end of the village was the Ragnar trailer. Ragnar village was always hopping, even when we came in just after midnight from our nighttime run, and at 5 AM right after I woke up. 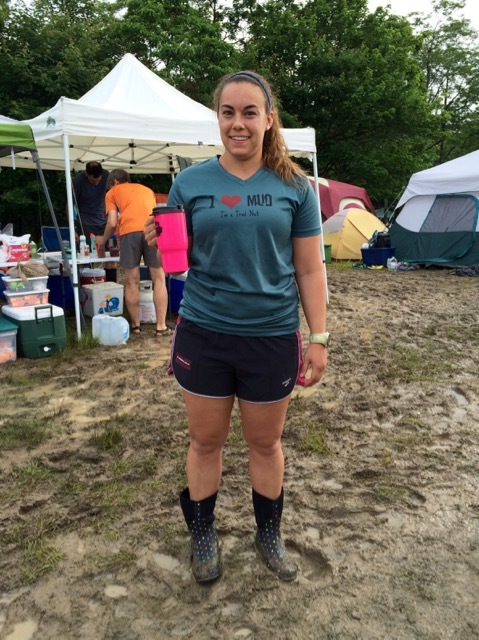 Back at camp, Meagan was sporting her I ♥ MUD shirt from the Trial Nut Half Marathon. How appropriate, but at the time I’m not so sure she loved mud. Eventually it was time for us to go to the exchange area and wait for our teammates to come in so we could head out on our run. While waiting it started pouring rain, and we debated on whether or not to leave our light jackets on. I was pretty sure that I wouldn’t need my jacket, but I took my sunglasses off and left them behind which proved to be a big mistake. 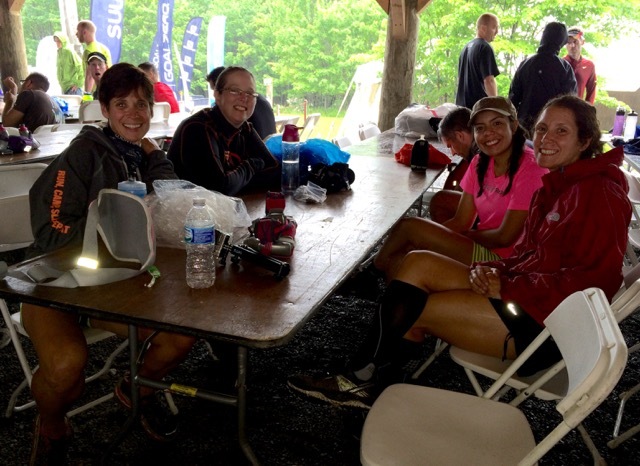 Gayle, Erin, and Lupe came in from their yellow trail run at 10:59 AM in heavy rain. 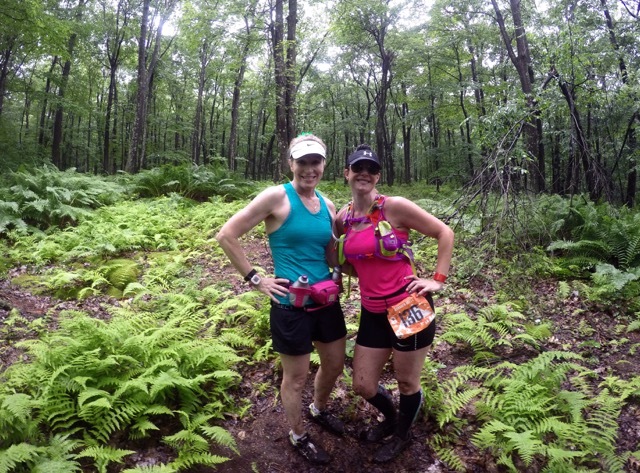 After spending the morning hearing how bad the trail conditions had gotten, and dreading our run, it was finally time to head out for what would be the final three runners on the red trail for our team. When we finished, our team would be done! 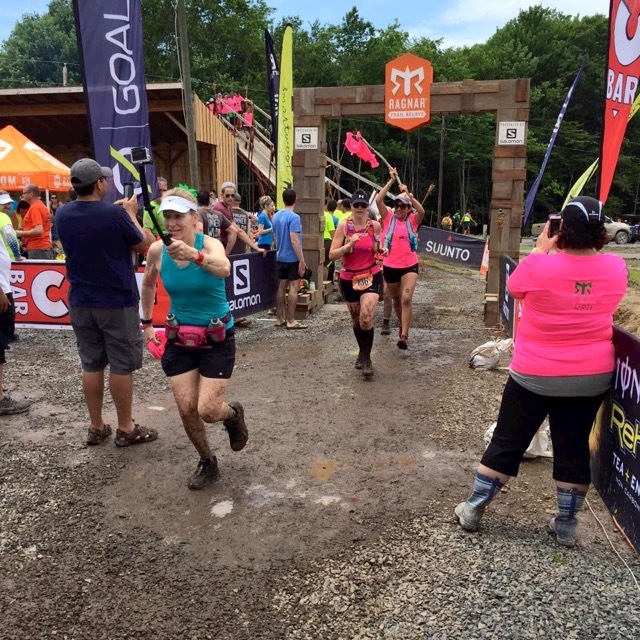 Once again with my GoPro in one hand and the other hand free to catch my fall if necessary, my teammates, running buddies and I took off out of the covered exchange area for one last time. 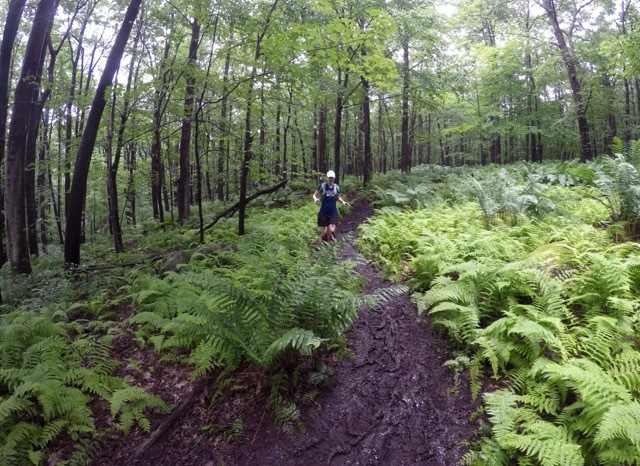 With rain bouncing off our shoulders and splattering mud up on us, we headed down the familiar trail until it veered off with us following the red arrows. Trail conditions were certainly worse than they had been the day before, but early on they weren’t horrible. It soon stopped raining and the sun came out. Without my sunglasses, and without a recent application of sunscreen, I hoped that we would stay in heavily wooded areas. At one point we realized that one of our runners wasn’t with us so we stopped for a few minutes to let her catch up. While waiting we posed for some pictures while we were still somewhat clean. Soon enough Julie caught up and told us she had wiped out in the mud. Oops – glad she wasn’t hurt (sorry Julie)! After Julie had a chance to quickly catch her breath, we took off again with Wendy leading the way. 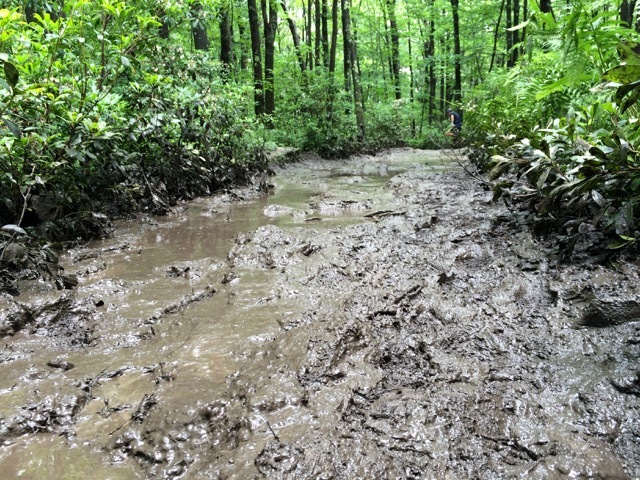 The farther we went, the muddier it got. 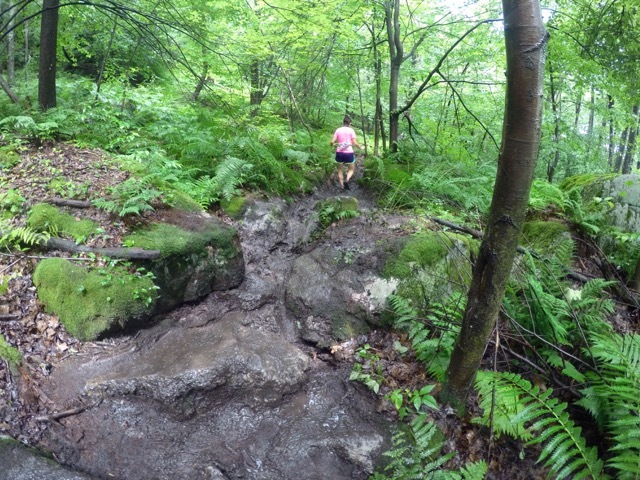 Running became down-right impossible and we picked our way through the mud and over the boulders by walking and jumping. 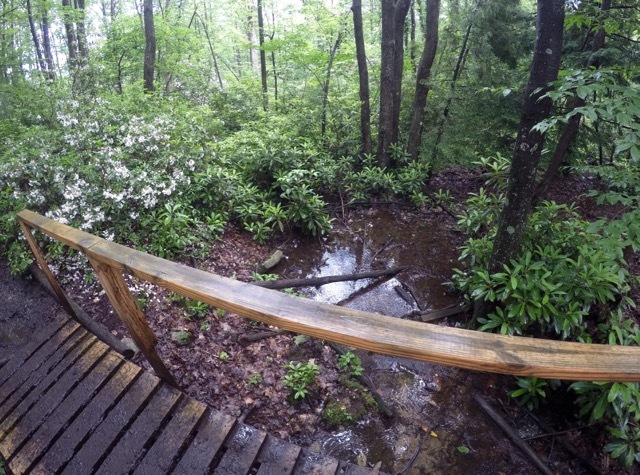 Occasionally we were treated to bridges crossing streams, but we learned not to expect them. At one point a guy went running past us quite quickly in his Vibram Fives. Shortly after I noticed his footprint in the mud and laughed. 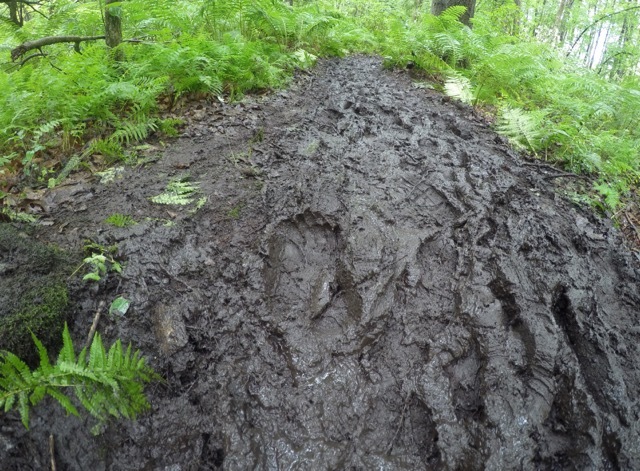 Had I not noticed his shoes, I might have thought that Big Foot had run down the trail in front of us. Eventually we came to the swamp. I had been dreading the swamp more than anything else, and had been quite nervous that I would be running through it in the dark. As luck would have it, it was broad daylight so I could savor every creepy detail. It didn’t look as bad as I’d expected, and I was somewhat relieved when I saw it. 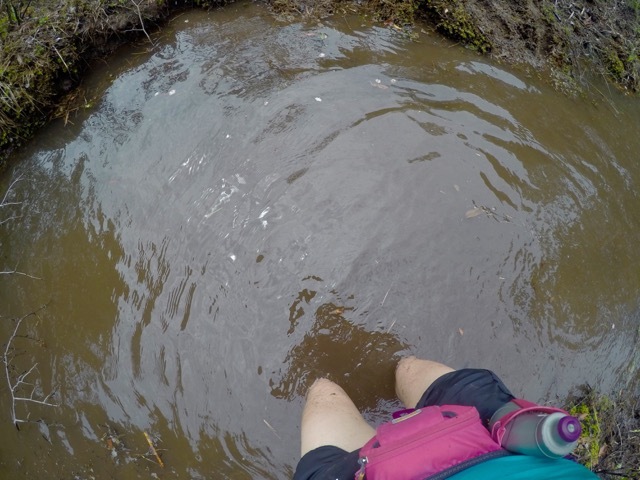 Having talked to many people about how they had approached the swamp, I had decided to brave the knee-high water over the calf-high mud. Following Rachel into the water, I breathed a sigh of relief at how cool and wonderful the water felt! Yes, our shoes sunk slightly into the bed of the stream, but it was nothing like the sticky mud we’d endured up to that point. Wendy followed me into the water, and I think that’s more of a shocked look on her face about at how cold the water was rather than how nasty; however, I can’t speak for her. After our first crossing we had another smaller stream to cross, and I think most of us were able to jump right across it. 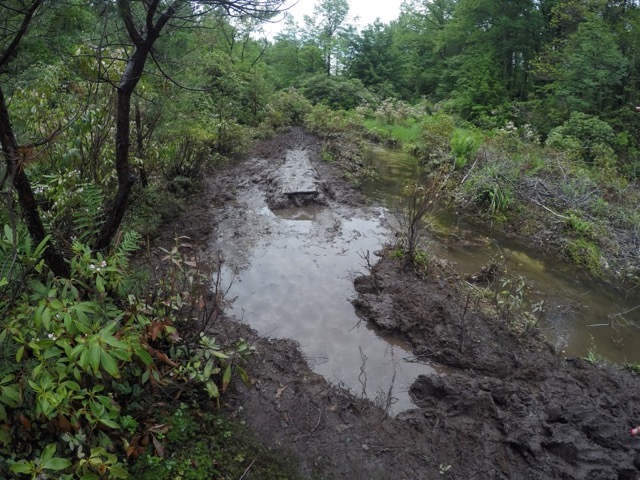 We had a few back-and-forths to make to get across the various little streams to get out of the swamp. 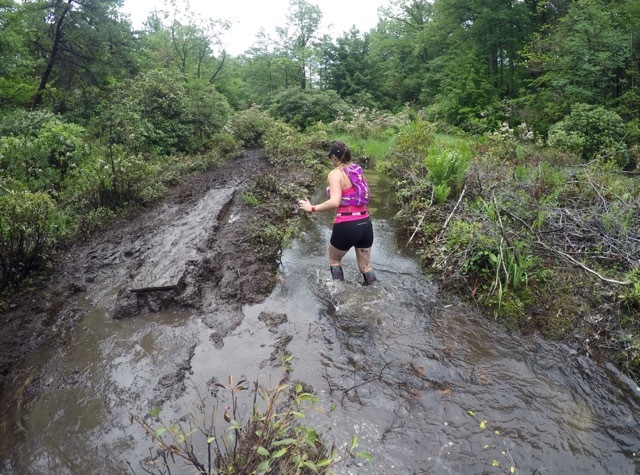 At one point Rachel and I decided it was easiest to walk up the stream, and then climb back on the trail after we passed the extremely muddy section. That worked well, and I was thrilled with how clean my shoes had gotten. My clean shoes didn’t last for long though! 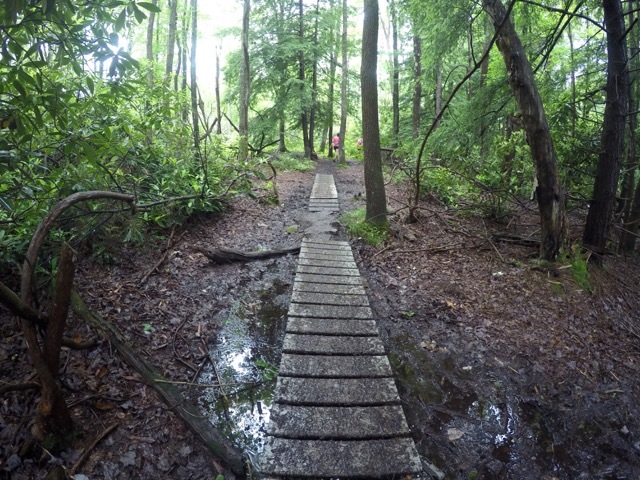 A long boardwalk got us out of the swamp and back onto the muddy trails. We came upon these moss-covered boulders and decided that it was the perfect place for a selfie. Look how happy and oblivious we look! 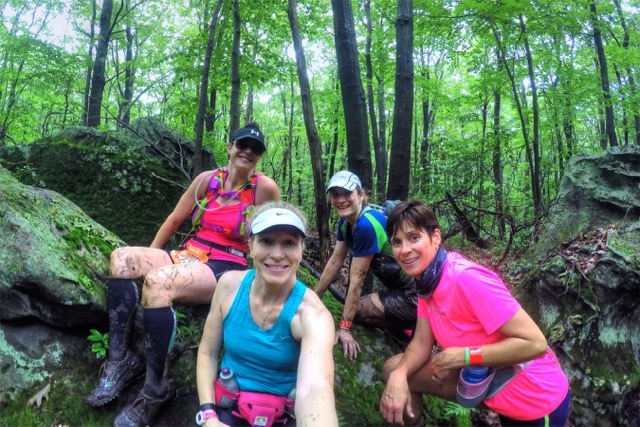 Shortly after that selfie, we came upon the absolute worse running conditions I have ever encountered in my forty years of running. 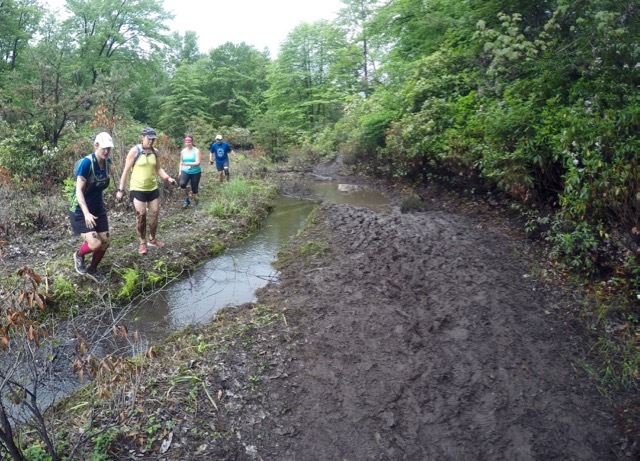 The mud was about ankle deep, and this picture looks more like a muddy river than a running trail. I very carefully pulled my phone out of its Ziplock bag and captured this moment. This video speaks volumes about what our run was like. We had a long uphill section that was very difficult to even walk up. 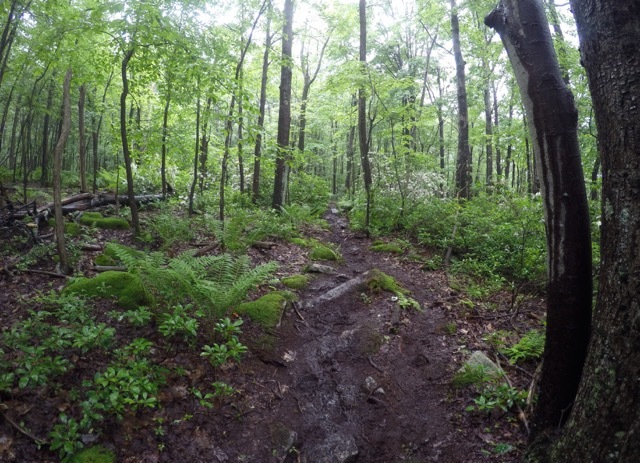 At times, to keep from slipping and falling, I had to do the herringbone walk like when cross-country skiing uphill. I stopped for a running shoe picture, but make the mistake of taking it while standing on a rock. 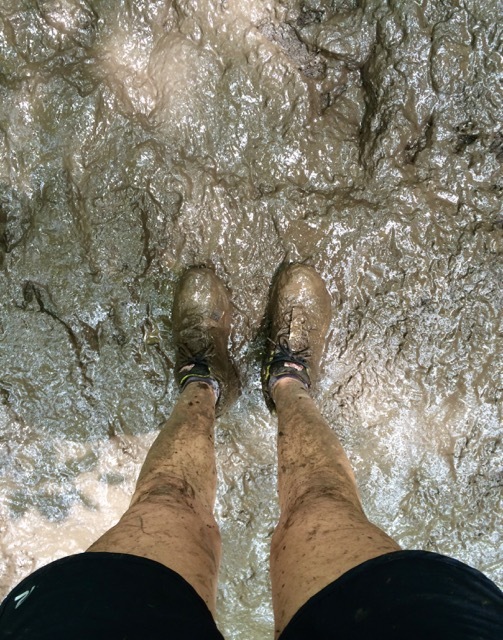 It doesn’t give true justice to what the running conditions were like, but I really didn’t want to stand still in the ankle deep mud because I didn’t know if my shoe would come with me when I pulled my foot out! It was wonderful to see the one-mile-to-go sign, but we knew that it wasn’t an easy ten minute run to finish, and that it was probably closer to thirty minutes. 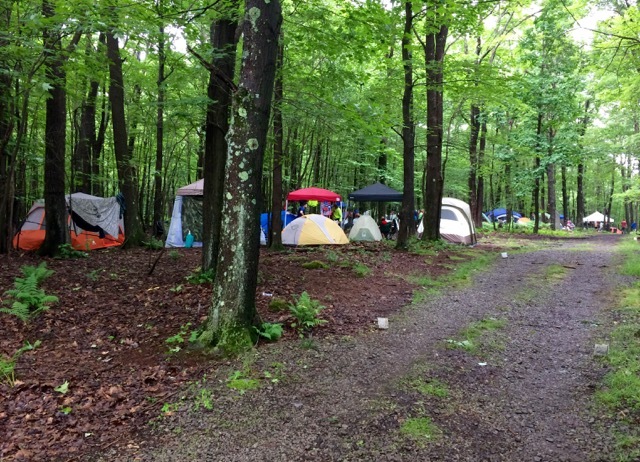 Eventually, we came to the electronic timing mats, then the tents, and finally the grassy area that lead to the bridge that would take us across to the finish line and have us completing the 2015 Ragnar Trail Appalachians WV relay. Our two teams were waiting for us and cheering us in. Once we were all together, two teams became one and we ran it in! 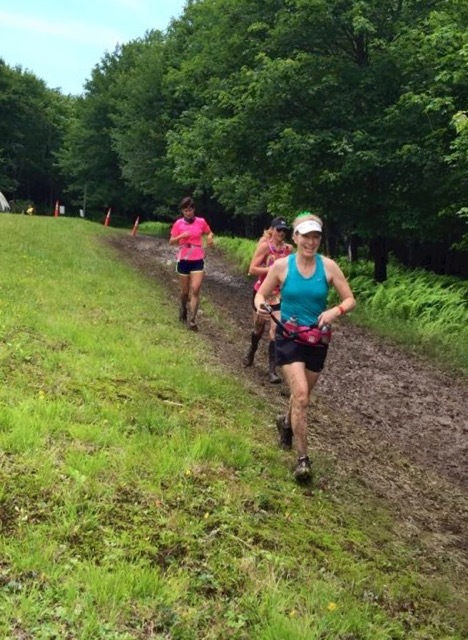 My group of red trail runners finished our 6.7-mile muddy slog in 2:55:33 (26:12 pace). Our projected completion time was 1:13:42 (11:00 pace). 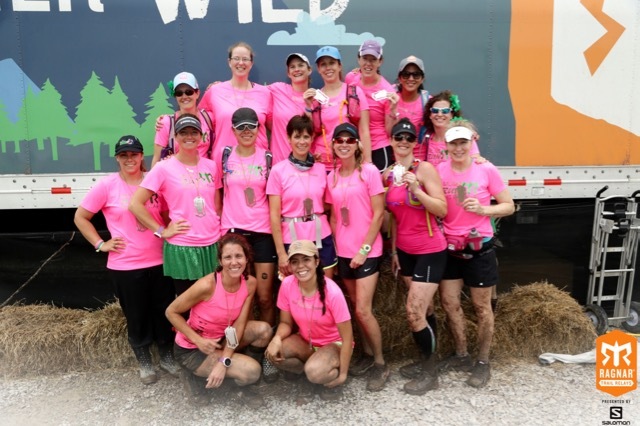 Our MRTT team finished in 26:23:24; however, it must be remembered that we tripled up on our final legs. 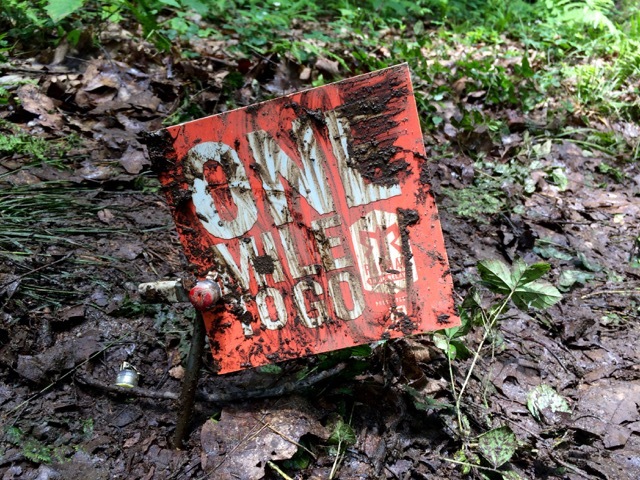 A special thank you goes to my husband Bill for putting together this amazing video of our muddy adventure! Happy to be finished, I rushed to get in the long line to hose off my arms, legs, and shoes. Multi-tasking while in line, I had Trigg take a picture of me with my medal and muddy legs. The mud wouldn’t come off with just the spray, but had to be scrubbed with our hands, socks, or whatever we had to use. After we cleaned up, and just before we took off, Rachel found this guy, and later found out that he’s the brother of someone she knew in high school! 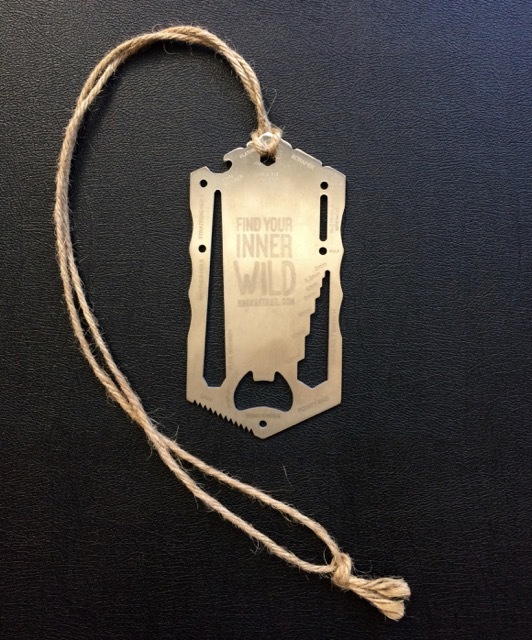 The trail medals are pretty cool and double as bottle openers, can openers, saws, wrenches, and lethal weapons. I love the shirt! It’s a cotton/poly blend that feels so good! It fits well, but all shirts had to be sized up one size in order to fit. 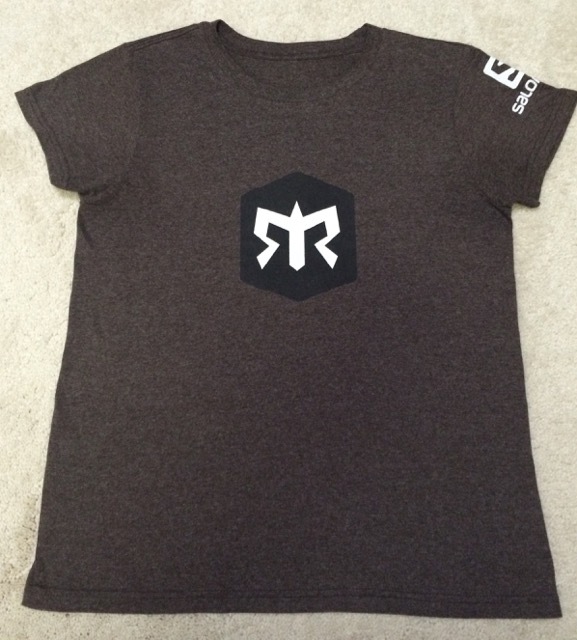 Considering how much I just said that I love the brown Ragnar shirt, it’s probably not surprising that the team uniform isn’t exactly my cup of tea – not that that surprises anyone. I had every intention of wearing the sparkle skirt in our team picture. Since I was running the final leg, Gayle brought my shirt to me for the picture (it was far too warm to run in anything more than a tank). I think she was being kind and didn’t bring the skirt since she knows my history with sparkle skirts. I kind of like saving them to wear only on National Running Day! And just like that, we were Trail Ragnarians! 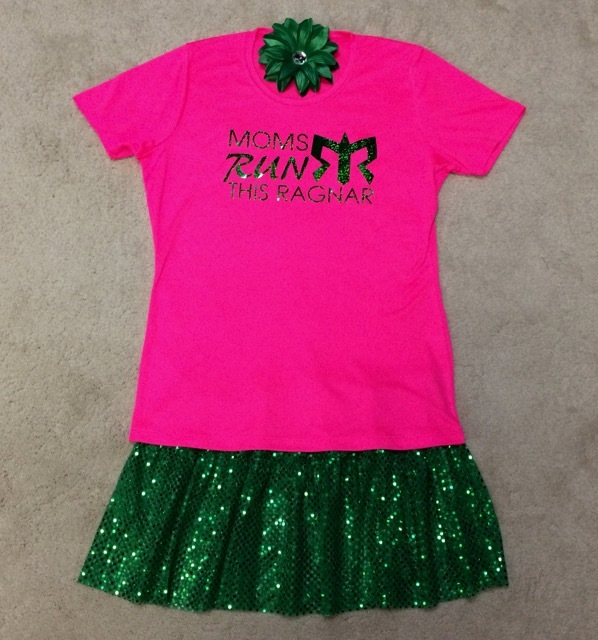 Have you ever run a Ragnar Relay or Ragnar Trail, or similar relay? You would love it, Courtney! My fingers are crossed for better weather in Richmond! Congrats! 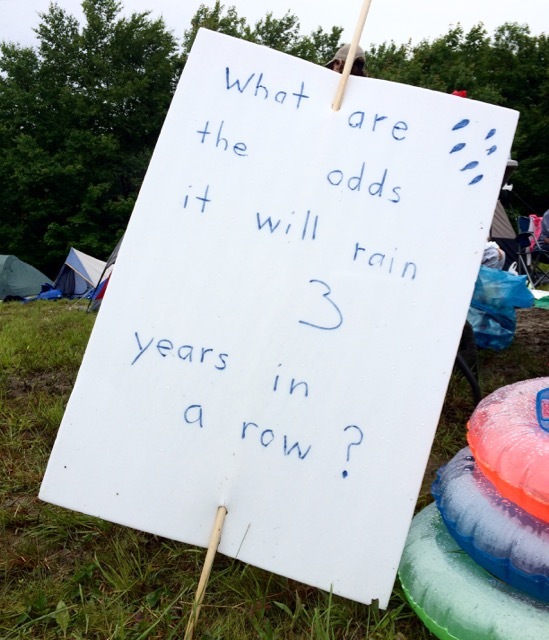 That sounds like a crazy few days, but you guys looked like you had fun despite the insane conditions! 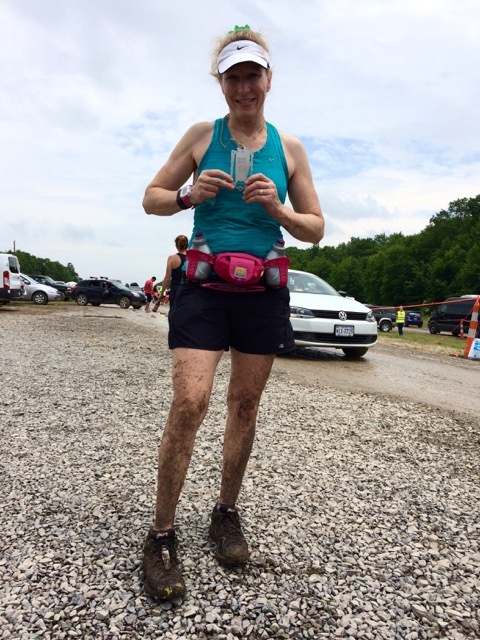 I’m hoping your next Ragnar is much less muddy! Thank you! 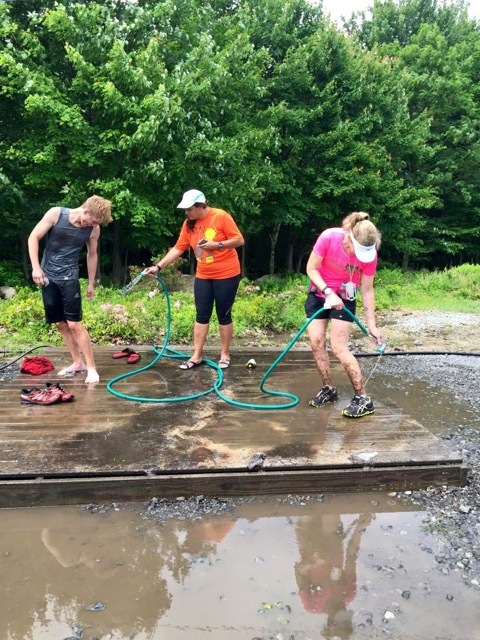 Ragnar DC is mostly on the streets, so there’s a good chance that it won’t be as muddy. wow, what an adventure! Holy moly mud warriors! 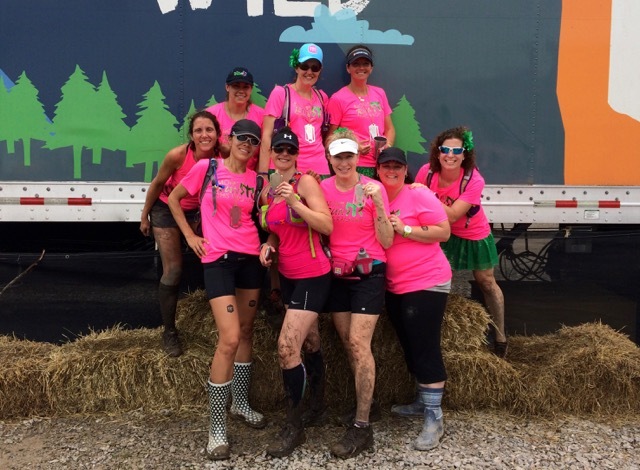 Mud kind of scares me I will admit, amazing ladies! 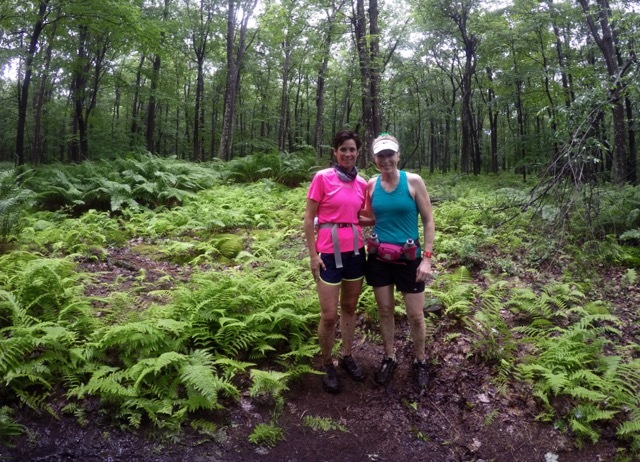 Mary Beth Jackson recently posted…A little of this and that kind of weekend! It was an adventure, indeed! My biggest concern was an injury from slipping and falling. 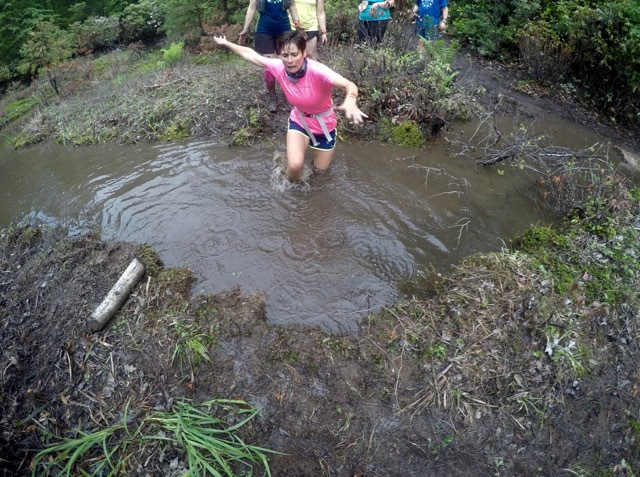 It was not a trail relay, it was a mud run relay! 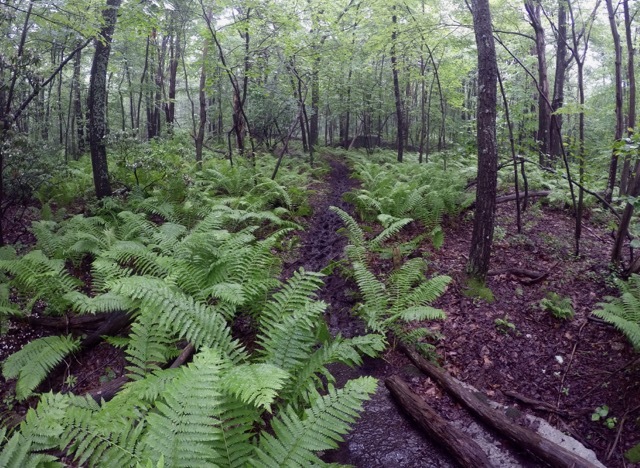 Seriously, though, how long do you think it takes the trails to return to normal after Ragnar? I can’t believe the campground keeps letting Ragnar come back. 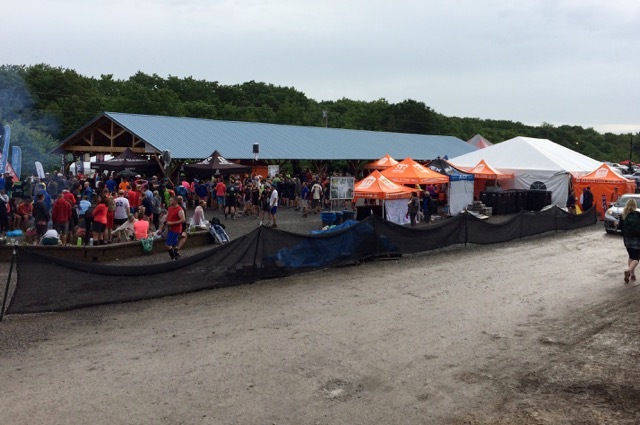 Ragnar can’t control the weather, but it’s really not good for the trails to have all these people running on them when they get into those conditions. 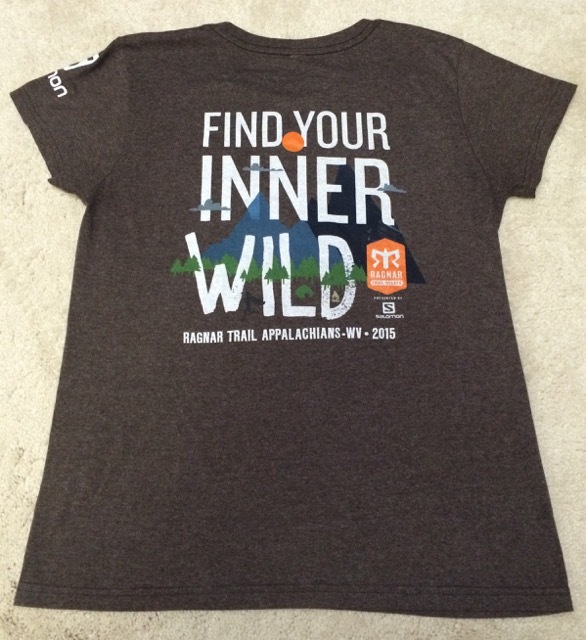 I love the trail shirt and medals! I also love that you referred to the medal as a lethal weapon – I think you’re right on that account! 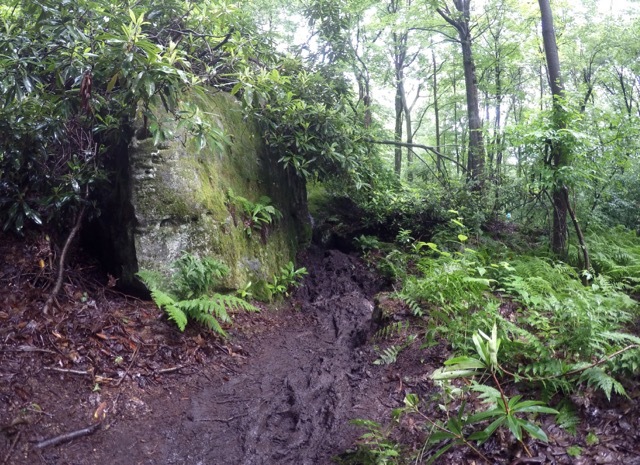 I think the red loop had the roughest trail conditions from the beginning, and they only got worse throughout the weekend. 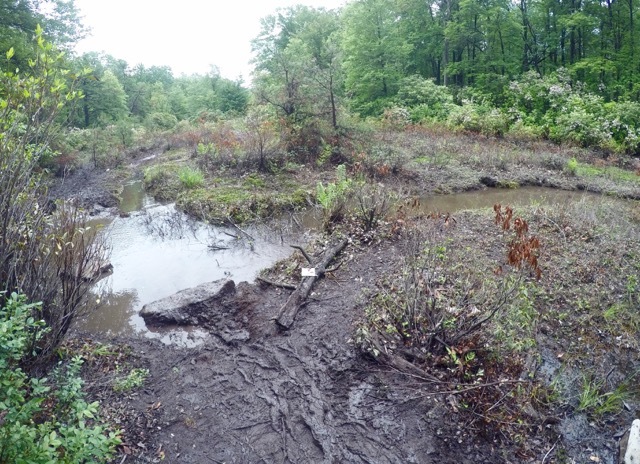 That swamp area definitely had more water in it than when Tammie and I went through.